When Johannes Huck leaves his home village at the end of the 1930s to go to war, he has a feeling of liberation. He hurls himself into the riskiest of operations with wild determination. Disguised as a deserter, he is to join the partisans and spy out their tactics. The plan is a success, and Jean Huc, as he is now called, finds shelter on a remote farmstead known as La Granne. Through his protectors, he indirectly makes the acquaintanceship of the other villagers – sympathizers; traitors; the desperate; the undecided; and last but not least the oddball Numa, who, with his archaic and anarchistic love of life and almost Schwejk-like naivety, will be the only one to survive the turmoil of the war unharmed. Huck shares their work and worries, and there comes the time when he has become so fond of the people and their countryside that he is no longer able to carry out his orders. But then he is exposed as a traitor. 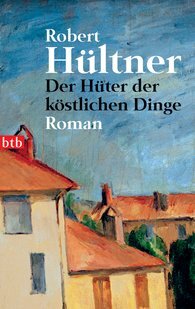 Against the background of true events, Robert Hültner writes of wishes and desires that don't follow the laws of war and peace; he writes of the gentle caress of the wind; of a quiet glass of wine. And he writes of the guardians of these precious things, those people who only follow their own rules.